I cannot believe it is already Day 5 for my GIU week. I have been using a different designer each day for my projects. Today I chose one by Traci Malnofski. She has many incredible stamps so it was hard to pick but I finally chose Serenity from her Fashionista line. Just as a reminder, please get your comments in by MIDNIGHT tomorrow night, Saturday ( Eastern Time ). I will pick 2 random winners and post them on Monday. You will have 2 weeks to contact me with your snail mail info. I am so happy to have been the GIU gal this week !! I found Unity Stamp Company many years ago when I saw a picture of one of their kits Hodge Podge of Happiness.. I actually ordered that and several other kits and have been hooked ever since. Thanks to Angela Magnusen and everyone at Unity for giving me this opportunity to showcase my projects this week. I have been amazed at all of the wonderful comments about my projects so far. If I have inspired you, I am grateful and would love to see some of your designs. Follow me by e-mail if you would like, from the link on my sidebar.. Please comment for a chance to win a Grab Bag of 25 Unity stamps.... I will choose 2 winners at random and post them on Monday so please check back here. So true, very nice. Thanks for all the inspiration this week. So awesome! I bend AND freak! I think my ZEN is creating too! So I can relate! I have thought about joining a yoga class many times, but I find it much more calming to create something instead! I have enjoyed your week of wonderful creations and I love seeing all the great Unity products! This week sure flew by! I hope you get to do it all again soon!! I Love this card! AWESOME! Thanks for a week of fun! 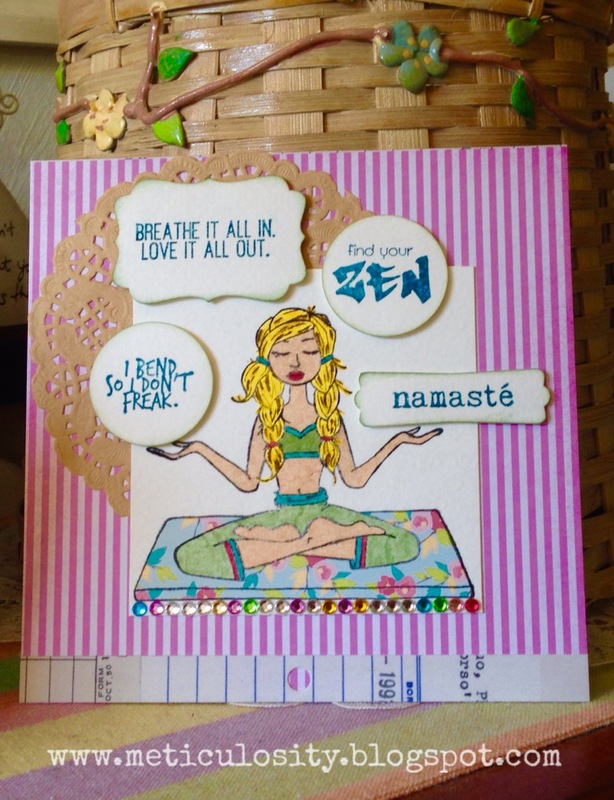 Awesome card and my ZEN is also being creative! Have enjoyed your week of GIU, thank you for sharing your projects!! This card and stamp set is so fun! I've really enjoyed seeing your work this week. Great card! I love that bright yellow hair! I saw that you used what looks like a library checkout card on the bottom, which is kind of cool, because the library is actually my Zen place! Thank You for sharing your work with us this week. I enjoyed seeing all of your projects and styles! Ack! This is so fun! Totally love it! she makes me want to head to the beach! Such a appropriate card. I went to a meeting last night and the program was a demonstration of Yoga. Since I don't bend in a lot of ways and I'm not real steady on my feet I didn't attempt a lot of the things they did but it was interesting to watch. Your card is great. Using all of the sentiments were a good idea. Love how you balanced two sentiments in the lady's hands! :D Super fun card Debra! That bright pink pattern paper just makes the stamped design pop! I really enjoyed looking at your work throughout the week. :) Thank you! Love the paper piecing and coloring! Fun card! What a great use of different papers and colors. The doily is an unexpected cuteness. Nice job. Again! I like the 'I bend so I don't freak'. Fun card! Reminds me of a balancing act, with all the sentiments around the image! Thanks for a great GIU week! All your projects have been amazing! **Your card collection is a fabulous accomplishment and showcases your talent nicely. Congratulations on a job well done! Cute--I like the rhinestones and the use of 4 sentiments. What a fun card and your paper piecing makes it even better! I could use a calm day like this after chasing around after my two girls! Thanks for a great GIU week with such a variety of projects. You have been marvelous this week and I have been so impressed by your use of different styles and types - you have excelled in every single one!! This card makes me want to go some place quiet and meditate!! So wonderful!! This is so cute! Using all 4 phrases really works wit this stamp. I tried yoga once ... that was enough. Like you, I find my zen in creating something. I've really enjoyed your week as GIU! You are very talented. I absolutely love this. Great layout and super colors! Absolutely fabulous yoga card,full of many good things:color,sentiment(wow using four is really awesome),and creativity.I really enjoy all of your techniques during this week.You have been creative and inspirational.Thanks. I've never seen a stamp like this before. The punk background sure stands out! Thanks for sharing with us this week. Another amazing card my crafty friend! Your are on fire this week! What an adorable card and amazing set Debra. Thanks for sharing you work! Another great Unity Gal! This is amazing! Thanks for all the wonderful inspiration this week!! I keep meaning to get this stamp. So cool. Love your design. Thanks for sharing this week. Hugz. Hi Debra. What an awesome zen card. Fun sentiments too. YOU are Fabulous -- and GIU winners ! !